Higher WORLDWIDE TRAVEL INSURANCE risks for travellers. We all want to be secure and safe when we decide to take a holiday or need to travel for business purposes. The ergonomics of travelling has changed in the past 15 years with the emphasis on safety and security due to the large number and continuous risk of a possible terror attack, wherever we are. Having Travel Insurance is more important now than ever. You should ask yourself this question:- if you were injured or involved in any form of terror attack, would your travel insurance cover you for medical and repatriation expenses? 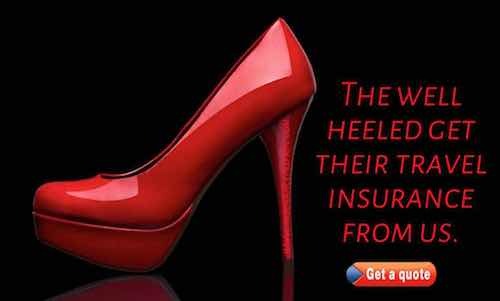 Our travel Insurance provider does. www.insuranceinspain.com can provide you with comprehensive worldwide travel insurance to suit wherever and whenever you are travelling in the world. Buying travel insurance may seem to some an unnecessary expense on the cost of your trip, but if you think about the changes taking place in the world today, the last thing you want is to be caught up in an event that you are not covered for. With terrorism very evident in many of the tourist destinations around the world, we should really consider travel insurance as a compulsory addition to any travel plans. www.insuranceinspain.com provides travel insurance (seguro de viaje) for people living in Spain (Reino de España). Authorised and Regulated by the Financial Conduct Authority and Approved by EU Regulators, our Worldwide travel insurance will be provided by a leading travel insurer for annual multi trip policies and also single trip cover for people living in all countries. Annual multi trip policies give cover for an unlimited number of trips with a choice of cover for Worldwide or Europe only. You can select from policies giving a maximum individual trip duration of 17, 31, 45, 60, 90 or 120 days. This is reduced to a maximum of 60 days for people aged 66 to 70 and 31 days for people aged 71 to 74. Policies for single trips are available for people aged up to 84 for both European and Worldwide destinations. In view of recent events, www.insuranceinspain.com believe that our clients should be insured for Emergency Medical Expenses and Repatriation should they be injured as a result of a terrorist attack and our underwriters have agreed to include this cover. In practice this means that www.insuranceinspain.com can provide worldwide travel insurance in Spain that will provide the necessary medical assistance required in the event that an insured person is inadvertently injured as a result of a terrorist action. Travel Cover for many pre-existing medical conditions is included, others may require you to make a quick telephone call to ensure that you will be insured in the event of a re-occurrence, or in case it causes you to cancel a pre-booked holiday. Call us direct on 965275727 and we can process your Travel insurance over the phone to just about anywhere you need to go in the world with excellent cover for most contingencies, should they ever happen to you. Talk to our experts and we will have a policy for you within minutes. Travel Insurance for your Wedding. You’ve been dreaming for years of your ideal destination wedding. Blue sea, white sand, brilliant sunshine, just enough breeze to keep you cool in your stunning wedding dress and the groom in his wedding suit, surrounded by your closest family and friends, with pretty tropical flowers. The time has arrived for your dream to come true. It’s all booked, the flights, hotel, photographer, flowers. All the necessary arrangements for the service and reception by the sea. The wedding dress is undergoing alteration for your final fitting to making you look the beautiful bride. The bridesmaids are all ready with dresses and accessories. Everyone has their passports at the ready and are getting excited, but have you thought about insurance cover just in case something goes wrong? Cover for cancellation of the Ceremony or the Reception - cover up to 1.000 Pounds. The airline loses your bags, along with the wedding dress and grooms suit – cover up to 2.000 Pounds. Your wedding rings have been stolen or lost along the way – Cover up to 500 Pounds. The photographer has been taken ill so can’t attend, or the photos get lost, stolen or damaged: Cover up to 500 Pounds. Adding Wedding cover onto your travel insurance policy will mean you can head off to your dream destination for your Wedding knowing that the Wedding insurance cover is in place for the little things that matter on your special day. Worldwide backpackers & student travel insurance. A levels are finished and you fancy taking a year out before university to see the world and experience life in a different country, or you have decided on a career break to do some travelling. The sensible option is to take out Backpackers Travel insurance and make sure you are properly covered, just in case something unforeseen happens. Money is a bit of an issue so you don’t want to spend too much on the insurance, but want to make sure that if the need arises you are fully covered and not going to get stuck. Our Backpacker & Student travel insurance offers just what you are looking for. Good travel insurance cover at a reasonable price for those on a tight budget. Comprehensive travel insurance cover without the frills, but that does give you the option to have a full on adventure holiday, with some hazardous sports cover thrown in. Whatever your chosen destination, Europe, Worldwide, or just Australia and New Zealand we can cover you. Standard cover from 1 – 15 months, which can be extended to 18 months. You’re not excluded with pre-existing conditions. Talk to us and we will see whether your conditions are already included in the travel insurance, or if you need to answer a few medical questions and pay a little more. If you are the adrenaline junkie and enjoy some hazardous sports these can be included too. They have been banded into categories, with some covered as standard like Sydney Harbour Bridge walking, war games/paint balling, zorbing, elephant riding, parascending, water skiing and sand dune skiing to name a few. If you have something more adventurous in mind, cover can be provided for a small extra cost. Black water rafting up to grade 5, heli skiing, bobsleighing, canyoning, sky diving or hang gliding. The www.insuranceinspain.com Travel Insurance policy also includes the standard covers within a general travel policy: Cancellation, medical, repatriation, missed departure, baggage, personal money and documents as well as much more. Depending on your age, where you want to travel and how long for, premiums can start from as little as €44 for worldwide cover for 1 month. Our Worldwide travel insurance policy allows you to head off on your travels safe in the knowledge that you are fully covered. Pet Travel and Transportation Insurance. Pets are a big part of our lives and are considered part of the family. With easing restrictions on pets travelling abroad, more and more of us want to and can, take our pets with us. Like humans, pets can get ill on holiday, during travel or in flight. It is essential to ensure that your pet has all the resources available to protect them whilst they are away from home. 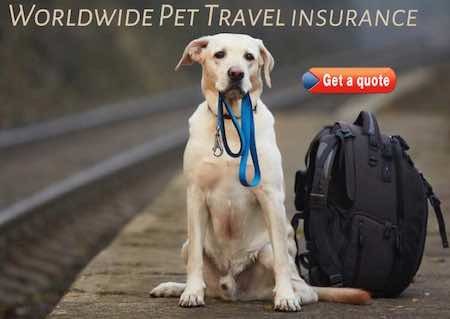 Pet travel insurance is an essential part of your holiday requirements if you are taking your pet with you. Emergency treatment is covered anywhere in Europe and you can use any vet you chose. If you are emigrating and want to take your pet with you, we can cover your pets for the trip and for any delays. emergency treatments and for such things as loss of documents. If you are sending your pet ahead of you or returning to your own country and sending your pet with a courier or specialised pet transport company, we can provide you with cover. Many local pet courier companies often combine transporting pets with carrying household goods and many of them do not have any form of pet Travel insurance to protect your pet. It is advisable to check and ask for a copy of their insurance documents before you commit to using any form of transport company in Spain. The vehicle may be insured but it is unlikely that they are insured or even regulated to carry live animals and/or pets. Knowing that your pet is covered if anything should happen will give you that additional peace of mind so that you can relax and know that your pet is well protected. Please call us for more details of this special cover.